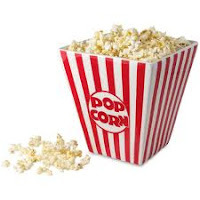 My friend Greg Asimakoupoulos can take something as simple as popcorn and write about it in such a way that you have to go and pop some. Where does that guy get his ideas? His mom should have called him "Cracker" Jack! Check out Greg's "stuff" here. It's fiber with a flair. The calories are next to none. It's just like eating air. I thought of popcorn manna-like. A daily gift from God. the corn is bound to burn. The hot-air kind was healthier. That's how it was made known. I make it the old-fashioned way. A kettle on the stove. and wait till they explode. But yellow kernels aren't my thing. I only like the white. A little butter and some salt. Let's pop some up tonight. Love it!!!!! I eat popcorn every night!!!!!! Danny made it to the AAA (Oakland A's). Go Danny!!!! Emily is popping corn right now - it sure smells good too!